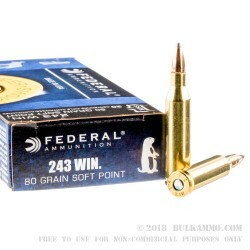 Federal .243 Winchester ammunition is an excellent choice for your next varmint hunt. These .243 win rounds feature an 80-grain soft point projectile, loaded into boxer-primed, noncorrosive reloadable brass cases. The soft point projectile allows for decent expansion and penetration, with consistent groupings at long range. 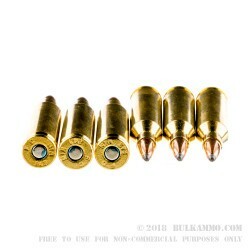 With a muzzle velocity of 3330 FPS, coupled with the expansion of the soft point, these .243 rounds have enough power to take down coyotes, prairie dog and even deer. The Power-Shok line from Federal offers consistent and reliable hunting ammunition at a price that keeps you out in the field. 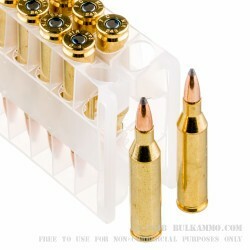 This bulk pack of .243 win ammo from Federal includes ten, 20 round boxes. With a reputation for producing high-performance ammunition, Federal’s name has become synonymous with quality and reliability. For nearly 100 years, Minnesota-made, Federal has provided generations of shooters with ammunition they can trust, for a wide variety of shooting sports.